WCBS highlights the importance of the annual drive, and what it means to students who are homeless across New York City. 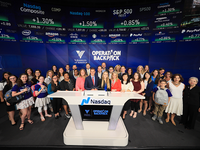 Fox 5 New York profiles Operation Backpack® featuring interviews with VOA-GNY President and CEO Tere Pettitt and backpack recipient 11 year old Heaven. Learn about what's new about this year's campaign, and how our partners, new and old, have responded to our call to fill 18K+ backpacks for children living in shelters. AMNY reports on the 2018 Operation Backpack® campaign. 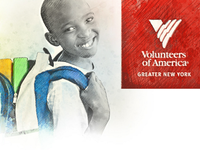 Listen to a radio spot featuring Operation Backpack® has been appearing on 1010 WINS. 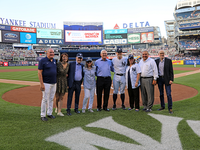 The Yankees invited VOA-GNY staff, board members, and partners to a game and to participate in a special home plate ceremony. 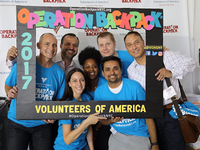 The 15th annual Operation Backpack® 2018 public campaign was featured on the New York City Patch website. Read more about our drive. Operation Backpack® supporter Kimya Nielsen was featured on local Montclair website, Baristanet. 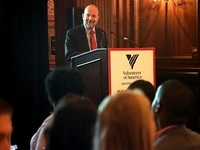 VOA-GNY board members, partners, staff, and supporters gathered at the NASDAQ MarketSite in Times Square to help raise awareness for the annual, city-wide campaign. Be Part of the #OBPFirstDay Campaign! 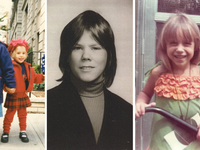 Starting on July 9, share a favorite “First Day of School” photo of yourself (or a child in your life) on Twitter, Instagram, and/or Facebook using the hashtag #OBPFirstDay, and The Weeks Lerman Group will donate $2 to Operation Backpack® for every photo shared! At this year's PromaxBDA conference, which took place in New York City, attendees were given the opportunity to participate in a community service project benefiting Operation Backpack®. From Sunday, June 17 through Saturday, June 30, customers shopping at participating Walgreens and Duane Reade stores will be able to donate to the 2018 Operation Backpack® campaign at checkout. News about the 2018 Operation Backpack® Kickoff Breakfast was briefly profiled on New York Nonprofit Media.